Infiniti QX30 concept revealed | What Car? 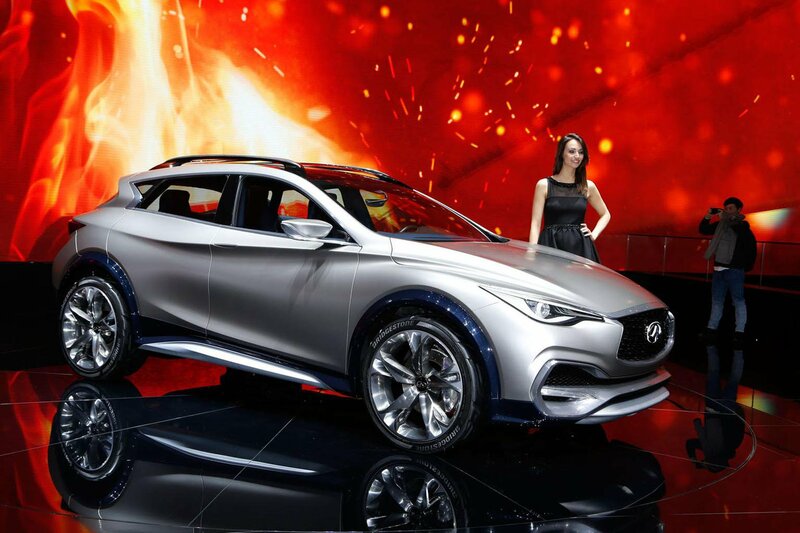 The Infiniti QX30 compact crossover will go on sale in Europe in 2016, and is the sister car to the Q30 hatchback. Revealed at the Geneva motor show in concept car form, the QX30 is a rival to premium compact SUVs like the BMW X1 and Audi Q3. Power for the concept comes from a 2.0-litre four-cylinder turbocharged petrol engine, which sends power to the rear wheels through a seven-speed automatic transmission. An all-wheel drive option is also available. Styled to look at home both in the city and in the countryside, the QX30 concept features 21-inch alloy wheels, large tyres, rugged front and rear styling and roof rack mountings. Inside, the four-seat cabin features leather trim with blue accents, and includes a central infotainment system. The QX30 will be build alongside the Q30 at Nissan’s Sunderland factory, and is one of a number of new Infiniti models to be launched in the coming years.